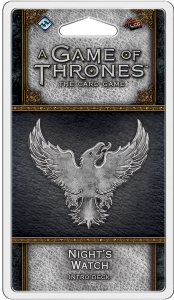 Join the battle for the Iron Throne with the Night's Watch Intro Deck for A Game of Thrones: The Card Game! This pre-constructed deck introduces you to the mechanisms and key characters of Night's Watch to provide a stable foundation and highlight the faction's unique features. By recruiting soldiers from your enemy’s ranks, you will be prepared to protect Westeros for this night and for all nights to come.